John has a very wide range of skills as a result of his extensive background in business, development management, networking, public relations, consulting and more. He has demonstrated this with a variety of groups around the country. 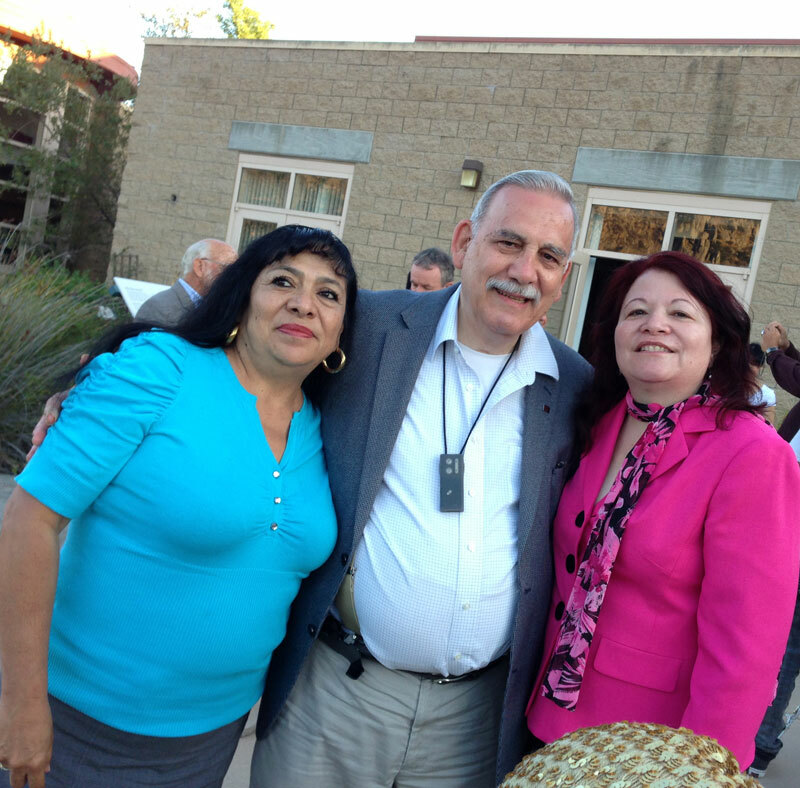 Here he is seen with Estella De Los Rios and Lisa. How to research, put together, and follow up on a proposal for funding from a grant-giving organization. How to plan, develop and carry out a direct mail campaign. How to prepare for, develop, and successfully present a personal ask for funds. How to research, plan and carry out a successful corporate fund solicitation. How to research, plan and carry out a successful foundation fund solicitation. How to plan, organize and carry out a successful group phone fund solicitation. How to plan, develop, and execute a successful membership campaign. How to research, analyze, and develop a successful organizational plan for both immediate and long term purposes. Determine what development management needs there are for both staff and volunteers and see that those training needs are met. How to prepare for, develop, and successfully carry out a public relations campaign. How to listen to the business needs of a client and, then, plan with that person how to use the resources available to her/him to best meet those needs. It often takes the form of a close examination of what they have been doing on this matter in the past, finding out what, if anything, has not been taken into consideration previously, researching and looking into some sensible alternatives that may, practically, help the situation, and developing a plan of action to deal with particular areas of concern, so that the client’s needs are satisfactorily met. How to work with group leaders to plan and carry out a networking campaign. This often involves studying the outreach efforts they have made in the past, finding out information about the natural constituencies of the organization, developing ways and means of reaching out to both old and new groupings in the community, helping the organizational leaders to contact, engage and follow up with these groupings, and working with them to develop and maintain ongoing relationships with various groupings in the community. Find out the client’s true needs, then provide them with ways and means to reach and satisfy more customers by selling the sizzle not the steak! Provide assistance in drawing out from the client the essence of what they are selling in order to better sell their product. Help clients take advantage of online sales, including the use of social media, in reaching many more customers than traditional forms of advertising. Help the client put to use some of the latest methods and techniques of marketing his/her product. For both individuals and groups, provide access to lawyers who specialize in particular areas of legal services for a modest monthly fee. Legal Shield is the national Pre-Paid Legal Services Organization that one takes part in and Parker Stanbury, LLP of Los Angeles, CA is the Legal firm that provides the attorney advice and action. As a Prostate Cancer survivor, John has developed a wealth of information about the Prostate and treatment for Prostate Cancer in the various stages of its development, as well as about other forms of cancer. He can share with you information about some of the latest cancer treatments that are now available, which treatment centers have which capabilities, and which support groups there are.